A crane fly, Tipula (Lunatipula) sp., family Tipulidae: Nematocera. 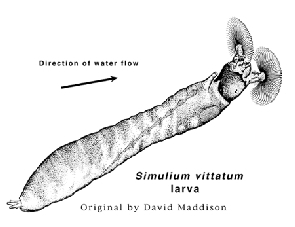 A black fly, Simulium vittatum, family Simuliidae: Nematocera. The holly berry gall midge, Asphondylia ilicicoides Cecidomyiidae: Nematocera. A predacious gall midge feeding on Aphids,Lestodiplosus sp., Cecidomyiidae: Nematocera. A stiletto fly, Therevidae: Brachycera. House fly larvae "in situ", Musca domestica, Muscidae: Brachycera. A flower fly, Syrphidae: Brachycera. A leaf mining fly, within its leaf mine, Amauromyza flavifrons, Agromyzidae: Brachycera.